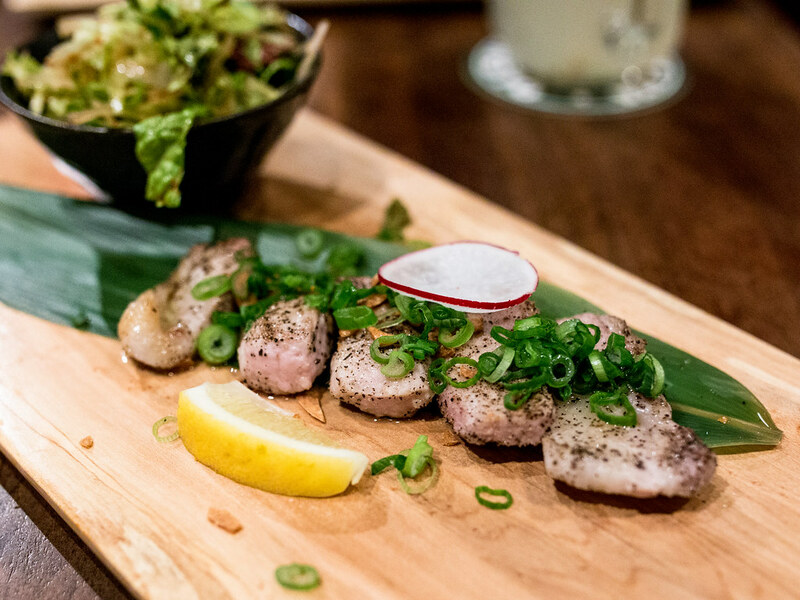 Kingyo is a popular east-end Japanese izakaya with west coast origins. During February Kingyo ran their own Kingyolicious event featuring a 3 course meal for $30 or a 4 course meal for $35. Diners had a choice of two dishes for each course and the menu was themed seafood and land. I was lucky enough to win an Instagram contest run by pekopekolife for two set meals, a perfect date night for myself and The Hubby. 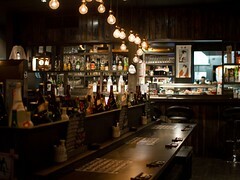 Atmosphere: Walking into Kingyo, I felt like I had found a secret club. Located on a quiet street, behind an unsuspecting wooden door, was a lively space filled with cheers, music and conversation. 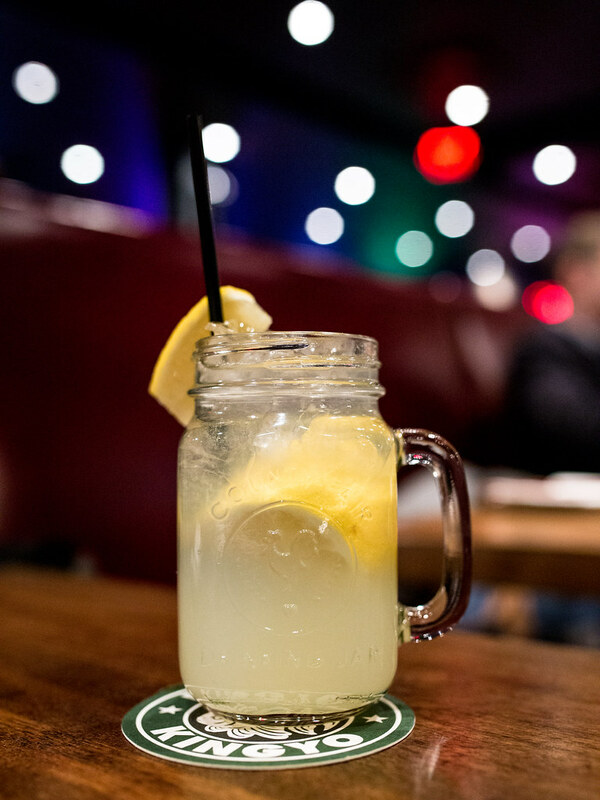 My eyes were drawn to the shiny pachinko machines that decorated the walls and the old school Japanese movie that was projected on the wall behind the bar. Every seat in the restaurant was taken and a queue of diners filled the entryway. Service: A few servers circulated our section of the restaurant and it was easy to get someone’s attention for service. Our tea and water were refilled throughout the night and each course arrived in quick succession without any overlap. 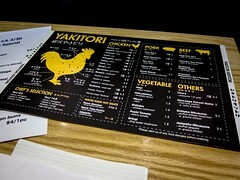 In general, I found the service at Kingyo friendly and efficient. 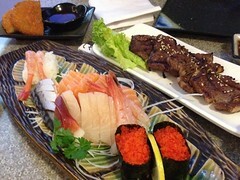 Food: With two options for each course, The Hubby and I simply ordered one of each. Seafood themed for me, Land themed for him with bites shared of course. 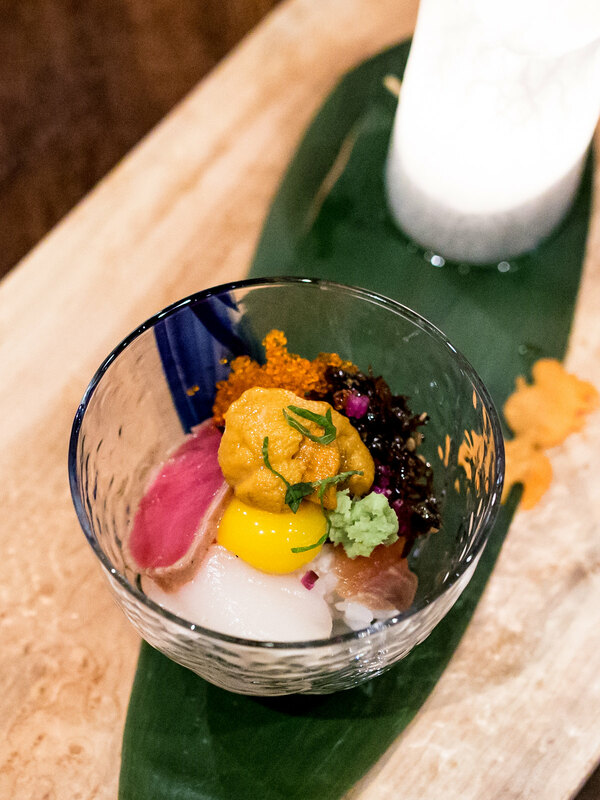 My appetizer was the Seafood Kingyo Shooter with scallop, salmon, tuna, uni, tobiko, quail egg and a host of other ingredients on sushi rice. 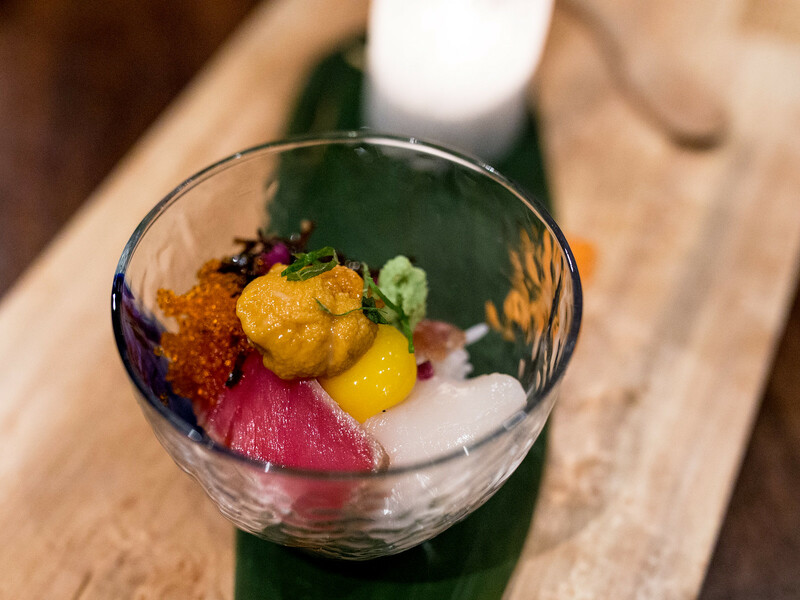 Colourful in presentation and with a wonderful variety of textures and flavours. Stirred all together, each spoonful was full of umami. The Hubby’s starter was slices of grilled, pork belly that was tender and well seasoned. I would’ve liked the pork belly crispier and the fat rendered more, but still a tasty, meaty dish. Seafood won the first round. 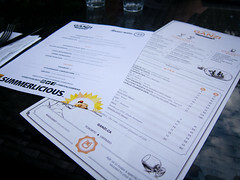 For entrees, mine was a sizzling plate of buttery seafood that included shrimp and scallop served with cod roe toasts. i did like the salty, buttery sauce but The Hubby’s lamb chop cutlets were killer. 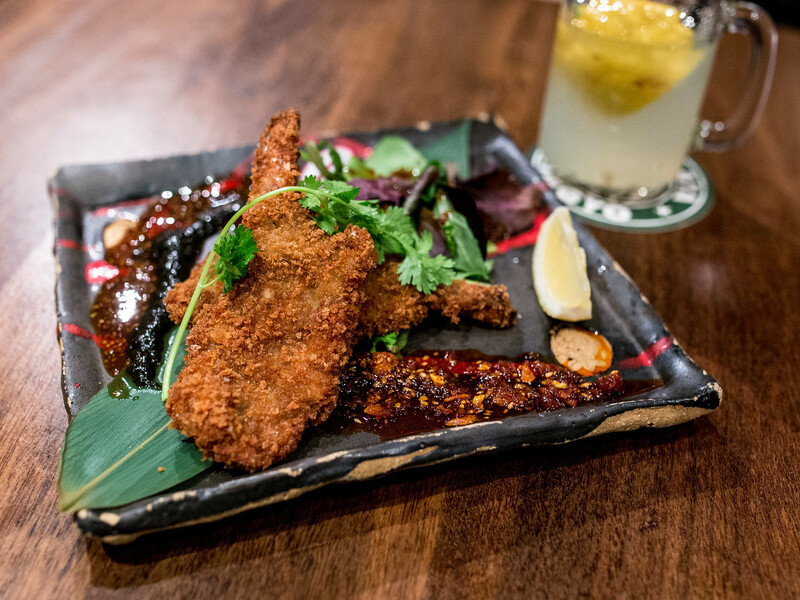 The two breaded and fried chops were gamey, so tender, so juicy and so good. Round two easily went to Land. The third round was strong for both themes. 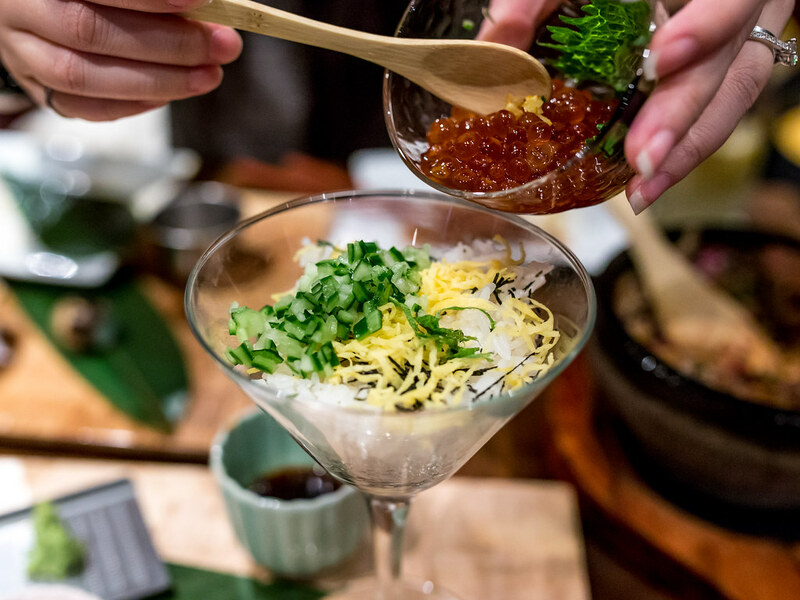 My dish was an ikura don, to be assembled at the table in a martini glass. 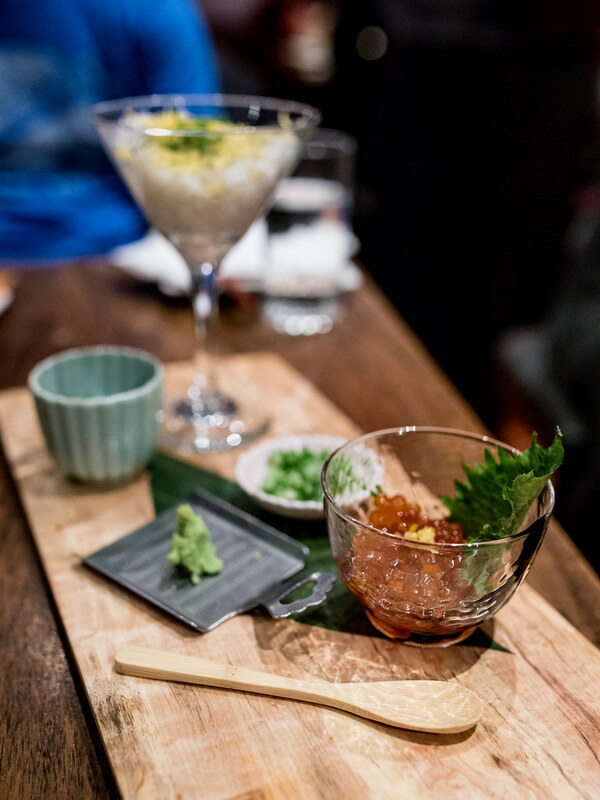 I love ikura and a generous portion of the salty balls of goodness was included. The Hubby’s dish was a Yukke Don. 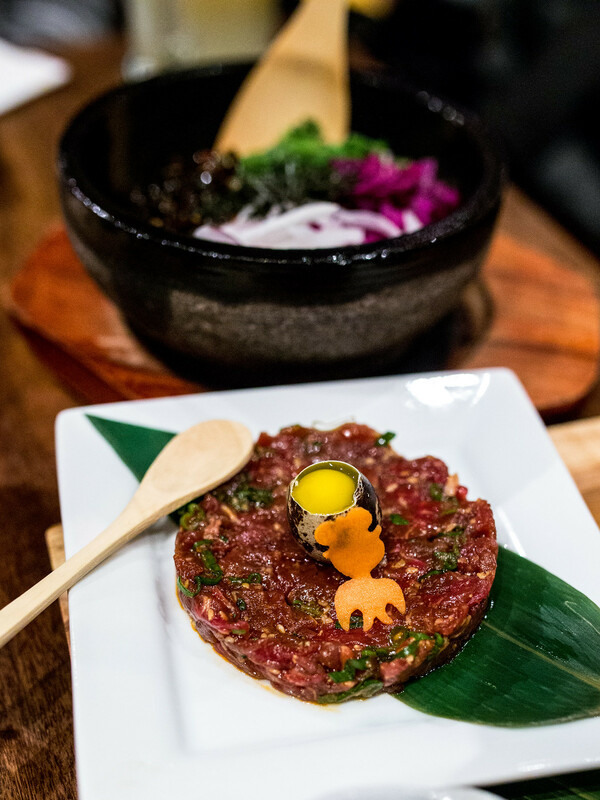 A plate of beef tartare was served with a quail egg and could be eaten as is, or mixed into the hot stone bowl filled with rice, green onion, kelp and pickled vegetables. 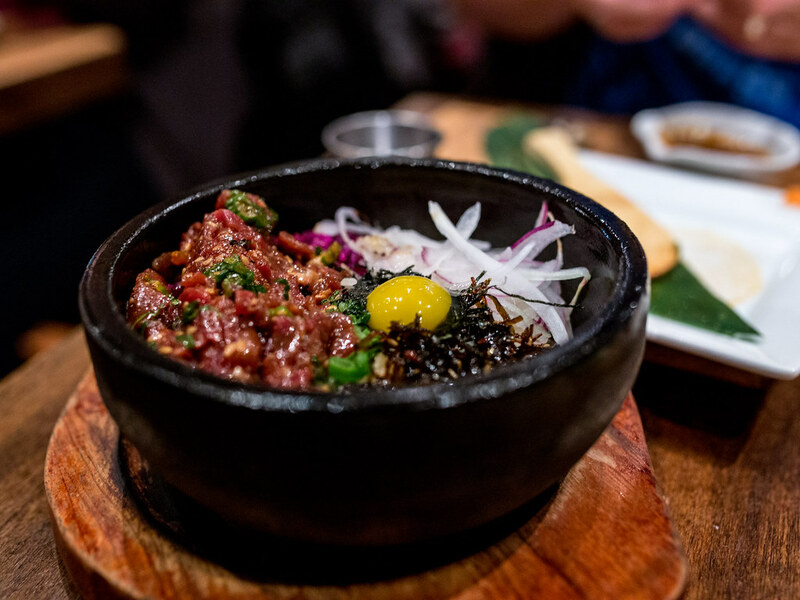 The tartare was well seasoned and once mixed into the rice bowl, created a well balanced dish that was savoury and filling with hints of acidity and sweetness. Round three was a tie. Dessert was a Japanese Tofu Tiramisu, perfect for The Hubby who’s lactose sensitive. 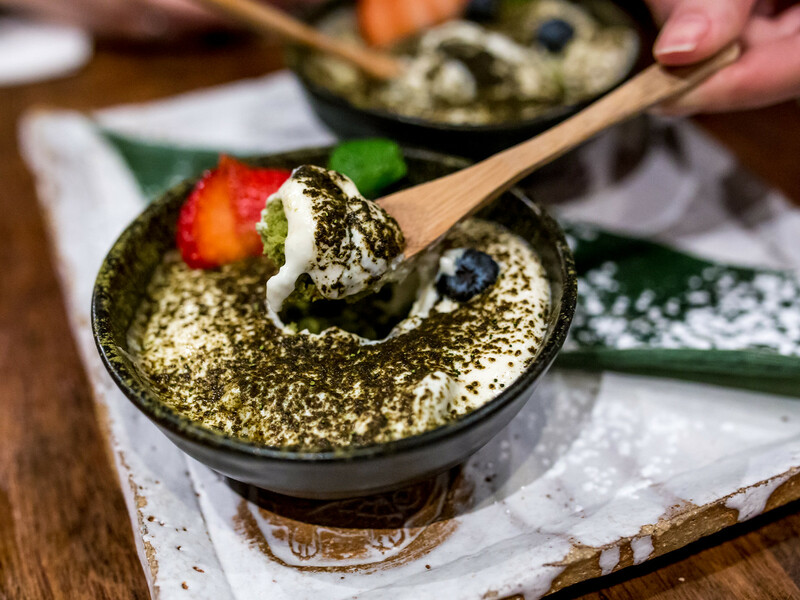 A base of soft matcha cake was covered in a thick layer of creamy tofu and topped with matcha powder. I found the top layer of matcha powder a touch bitter but was impressed with the texture of the tofu. Overall, Kingyolicious was a delicious snapshot of the food available at Kingyo. 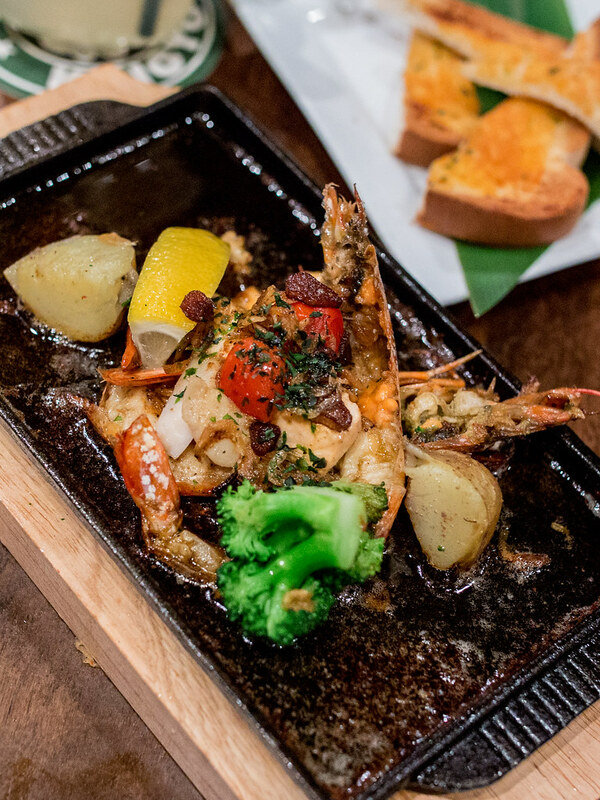 This meal makes me eager to return to explore their regular menu and I would also love to see some of the special dishes reappear (seafood shooter!). 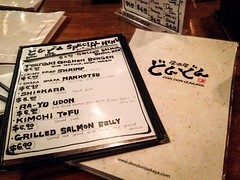 A few more visits like this one and I can see Kingyo becoming my favourite izakaya in town.